I swear, the man is either a genius at finding buried nuggets of gold in drama scripts, or just has tremendous luck/talent in turning all projects he touches to absolute entertainment treasures. He's played quite a wide range of leading roles over the past years, from mysterious and charming stalker to man-boy boss and dark revenger. And weirdly enough, he was equally, undeniably appealing in each and every one of these parts. I love that he continues his role exploration with Alice, playing probably his most outright hilarious and random role to date as bipolar, ridiculously expressive Cha Seung-jo. It took a bit, but now I am fully onboard with his character and ready for the swoony, dreamy goodness to come. Interestingly, all of PSH's projects seem to start slower than the average drama, or at least take a while for his part to warm up. It's perfectly fine with me, since I'd much rather have a slow start but solid middle/ending rather than a racing start / screeching end. Alice is no different, and even though I held faith in him, I was nearly bored to death by episode 1 and the first half of episode 2. I think the exposition, including everything with Moon's ex-boyfriend, unfortunately took a lot of steam out of the story. Instead of moving into what we knew would come, we get rather depressive observations of the lives of the rich vs. poor and unnecessary detail into the rather boring errand-girl job of the heroine. 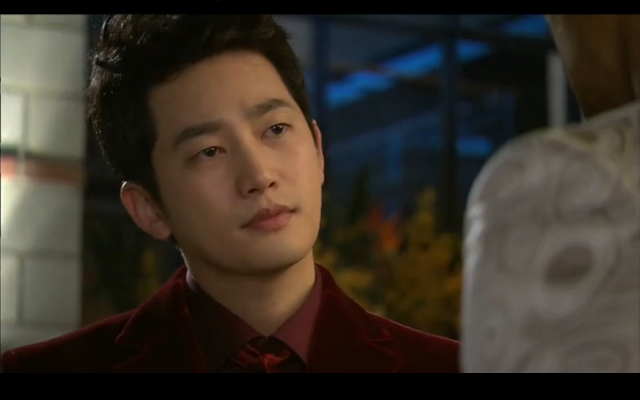 Seung-jo also admittedly takes some time to accept and love. He's wonderfully sporadic from the start, but we only get pieces of his story, all of which are focused upon getting revenge on his wife. Said wife? None other than the seemingly shallow, frivolous antagonist to our heroine. And since we don't really care about her, we consequently don't care much about his revenge plot. Luckily, this plot point fades after episode 2, and turns out to actually serve a pretty substantive role in building the bond between our leads. And surprisingly, so did her ex, which surprised me because I figured he'd just be some pretty-faced guest role that'd do more harm than good to our lead ship. However, the two occurrences end up having a believable tie-in, and gives me faith that our writers know exactly where they're headed. Can I also just say it was so freaking endearing that our lead man actually spent a good chunk of time supporting the alternaship of Se-kyung + ex-bf??? You don't see that often, and it amazingly did wonders in building up to Seung-jo's character. So anyways, even though episodes 1-2 weren't that awesome, I'll tell you, I was HOOKED by episode 3, and even more of a goner after 4. I'm not entirely sure what changed - maybe the fact that we're finally focused on our main pair, without the many distractions, or that the soundtrack suddenly improved, or (most likely) that Seung-jo threw out all his beans and went lovably crazy. It's weird, because I went from near apathy for all the characters to suddenly liking all of them, even the seemingly evil Yoon Joo. Turns out our people in Cheongdam-dong are actually layered beings, and boy is it refreshing to finally see something that doesn't warp everyone to an extreme. Our goody heroine turns out to be quite (understandably) selfish, our villainess to be more intelligent and industrious than her gold-digger persona belies, and our hero a true-romantic underneath the veneer of pure insanity. I'm loving that the plot isn't exactly unfolding as expected either. We probably thought we'd get our money-hungry Cinderella purposely trying seduce Park Shi-hoo's rich chaebol, but instead, she so far has no idea who he is. Of course, the romance is decidedly one-sided so far, with Seung-jo now clearly and madly smitten and Se-kyung breezing right on past him. I'd actually prefer they keep up the fake identities, because we need the reassurance that she'll like him for who he is rather than for his money. I'm also interested to see how she copes with and falls for him despite his severe bipolarness. The Alice in Wonderland illusions are actually working well for me so far. It's not as cheesy or easily predictable as expected, certainly not after episode 4. Looks like Seung-jo is cut out now to not only be the Mad Hatter, but also the White Rabbit. Our Queen of Hearts has become more of a guidance counselor, and I'm excited to see what other characters crop up. As for our Alice, she's slowly growing on me, though as of now she's got a long ways to go to catch up to Seung-jo in my affection. Episodes 1-2 were not very good for her, as the show chose to paint her in the most depressing, overly-earnest and slightly pathetic light. Episode 4 started showing her capability and also her selfishness, but I'm liking that she's not the typical good-girl of dramaland. She's realistic, and as long as she's not a jerk to Seung-jo I'll be satisfied to have her as the lead. Moon's also a very skilled actor, and even if I haven't really warmed to any of her works in the past, I really admire the earnestness she puts into each of her characters. Overall, episode 4 was an amazing win, in that nothing played out as expected. We get the Cinderella ball, but a very un-Cinderella proposition from lead number 2, followed by the most awesome use of soy sauce I've ever witnessed by lead number 1. I'm so, so excited for episode 5, and can only hope the plot continues to unfold as spectacularly as the past two episodes have.